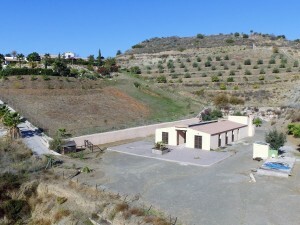 This lovely property is situated in a lovely Spanish village of Albanchez. Where you can find everything for your daily life such as: banks, bakery, supermarket, a shop, bars/restaurants and a hotel and a 24 hours medical centre and a communal pool. This lovely house is completely walled and situated on a good sized plot. Through the gate you enter the paved drive way where you also find the garage. You enter the house through the large covered terrace, to enjoy a nice meal or just to relax. From the terrace you enter the fully equipped kitchen. At the end of the kitchen there is on the right hand side the family bathroom, on the left hand side a bedroom and there is also a little storage room for the washing machine. Next to the kitchen there is the spacious and bright living room with a pellet burner and a ceiling fan. In the living room the patio doors leads to the glazed terrace with views over the pool and the garden. From the living room you have access to two spacious bedrooms with a bathroom en suite. Back to the front terrace there is on the left hand side a covered terrace closed with mosquito screens, ideal for dining outside. There is also a garage. 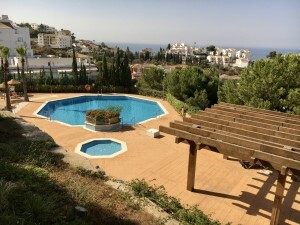 On the front there is the swimming pool surrounded with a paved terrace. Most of the plot is paved, which is ideal for low maintenance. 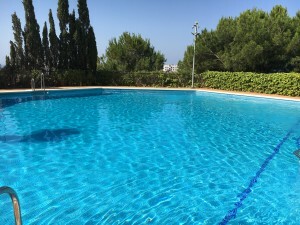 Extra`s: The property has warm/cold air conditioning in the 3 bedrooms, living room and the kitchens, and there are also a water softener installed. Water deposit of 1000 liter, water osmosis, mosquitos screens, warm water by solar energy and an electric boiler. If you want to live close to a village but at the same time you want to be private with magnificent views, than this is the opportunity. If you want more information or visit this beautiful house, contact us now!